Following 2 days of strong competition in the CanSat Ireland National Finals, students from St. Columba’s College in Dublin won the coveted national title and will represent Ireland at the 2017 European CanSat Finals, to be held at the Applied Space Technology and Microgravity (ZARM) at Bremen University, Germany from 28 June to 2 July 2017. 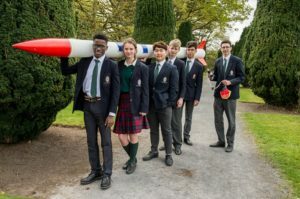 The CanSat Ireland competition is a joint collaboration between ESERO Ireland and the CEIA and is co-funded by the European Space Agency and Science Foundation Ireland. A CanSat is a simulation of a real satellite developed in the size and shape of a soft drink can. A European Space Agency initiative, CanSat is designed to inspire young people to pursue a career in the STEM (science, technology, engineering and mathematics) with the ultimate goal of ensuring the availability of a highly qualified workforce in the space industry of the future. In recent months, regional competitions have taken place across Ireland, in partnership with the Institutes of Technology in Athlone, Cork, Dublin, Galway, Limerick and Sligo. Regional winners from Moate Community College (Athlone IT), Mount Mercy College (CIT), Belvedere College and St. Columba’s College (DIT), Colaiste Muire Ennis (GMIT), Kilrush Community School (LIT), and Mercy College (ITS), gathered in Emo Court, on Thursday 27 April, and launched their mini-satellites in rockets built and launched by the Irish Rocketry Society. On Friday, 28 April, these national finalists presented their analysis, recordings and flight patterns to the judging panel consisting of Neil Murray ESA Engineer, Niall Smith CIT/Blackrock Castle Observatory and Stephanie O’Neill, ESERO Ireland Manager. “CanSat is a unique space project that simulates a real satellite which fits into the volume of a soft drinks can – students get first-hand practical experience of a real space project. By encouraging and exciting transition year students about the possibilities of a career in space and STEM, this initiative is not only effective but great fun for students, and we look forward to seeing more entries across the country each year,” said Dr. Eamon Connolly, Electrical and Electronic Engineering Promotion Officer,CEIA – Cork’s Technology Network. Sixteen teams will participate in the 2017 European CanSatFinals, which will be held at ZARM in partnership with the University of Bremen from 28 June to 2 July 2017. There will be 14 winners of CanSat National competitions from Belgium, Czech Republic, Denmark, Germany, Greece, Ireland, Italy, Portugal, Poland, Romania, the Netherlands, Spain, UK and Nordic countries as well as an additional two teams coming from countries without a national competition but selected by ESA. In previous years’ students from Ireland have achieved notable success in the European CanSat competition, run by the European Space Agency (ESA). 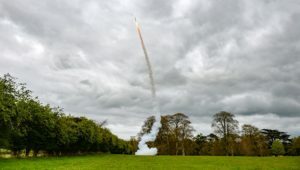 The competition is a joint collaboration between ESERO Ireland and the CEIAand is co-funded by the European Space Agency and Science Foundation Ireland.